Since 2010, ANIM successfully implemented the first six annual Winter Music Academies. The Winter Music Academy is an 8-week intensive music festival combining education and performance designed to ensure the continuation of ANIM’s programs during the three-month winter holiday. It offers ANIM and non-ANIM students a chance to improve their musical abilities while participating in intercultural dialog with guest music educators from around the world and music students from around the country. The Winter Music Academy contributes to promoting gender equality and empowerment of Afghan girls through music education, diversity, multiculturalism, and intercultural dialog through the presence of both international and Afghan teachers. It provides cultural integration of ethnically divided youth, underprivileged children, and marginalised communities. During the Annual Winter Music Academies, ANIM invites 10-15 guest artists and educators from around the world to teach individual and group lessons, offer masterclasses and workshops, and participate in a weekly concert series for the community. In the last six Winter Music Academies, ANIM has hosted over 50 guest artists and educators from Australia, Bolivia, Canada, Denmark, Finland, France, Germany, Italy, Mexico, South Africa, Switzerland, Tajikistan, India, Iran, Russia, the United Kingdom, and the United States. Additionally, ANIM has hosted several expert Afghan musicians from Kabul, Herat, and Badakhshan who provide a diversified and enriched program significantly beneficial to ANIM’s students of Afghan and Indo-Afghan traditional music. The Winter Music Academies are in operation from Saturdays to Wednesdays from 9:00 a.m. to 4:30 p.m. For eight weeks, students come to ANIM in the bitter cold to learn each day from the full-time faculty and from visiting artists. An extraordinary variety of musical and educational opportunities are available to students during the Academies, such as American fiddling s, jazz, bluegrass, world music, Alexander technique, drum circles, dance classes, chamber music coaching, ensemble rehearsals, private lessons, group workshops, and masterclasses. Additionally, each year the Academy program is strengthened by including core classes in Computer Technology and English. A key element of ANIM’s Annual Winter Music Academies is facilitating community outreach and engagement which ANIM achieves through inviting guest students to participate in the Winter Academy and through providing a diverse weekly concert series for the community. During the Annual Winter Music Academies, ANIM opens its doors to guest students who are unable to regularly enroll at ANIM. 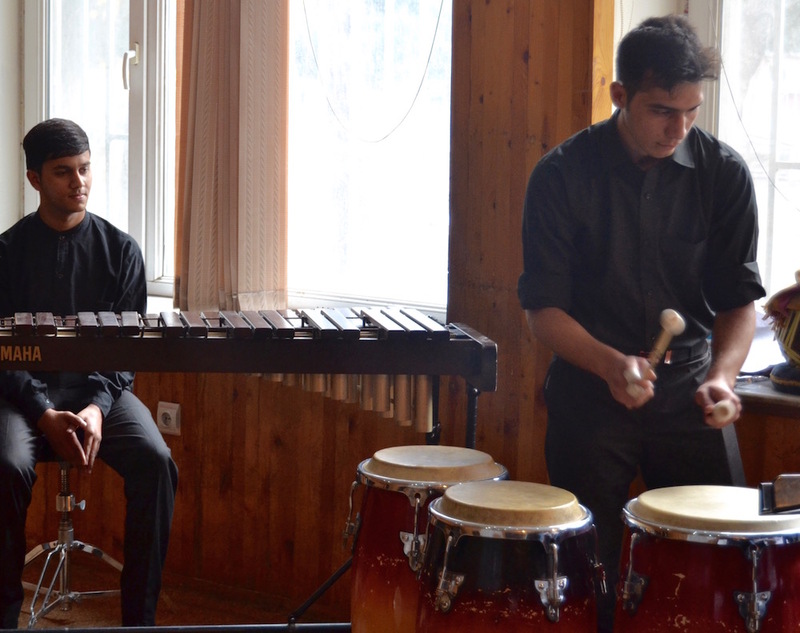 Through the assistance of the Aga Khan Trust for Culture, ANIM has hosted a large group of students from Herat for the last three Winter Academies, as well as music students from Kabul University and the Aga Khan music program in Kabul. The introduction of these students to the ANIM family each year makes a wonderful and lasting impact on the school and its students. Guest students and ANIM students have the opportunity to learn from each other musically in lessons and to meet each other socially at lunch. During the Winter Academy, ANIM offers a weekly concert series for the community and outreach concerts for local schools and orphanages. These concerts feature guest artists performing side by side with faculty, fellow guests, and students in a variety of musical styles including Afghan traditional, Western classical, Indo-Afghan classical, jazz, and fusion. The Annual Winter Academies culminate in a large gala concert attended by hundreds of people including families, friends, social and political figures, diplomats, and government officials.